When it comes to street food, Latin is pretty much synonymous with the idea. Tacos, burritos, empanadas—they’re all easy to transport, can be filled with almost anything you can imagine, and are always easy and delicious. And now, Nicole Marquis of HipCityVeg and Charlie was a sinner. has extended the anything-possible fillings to vegan food at Bar Bombón. 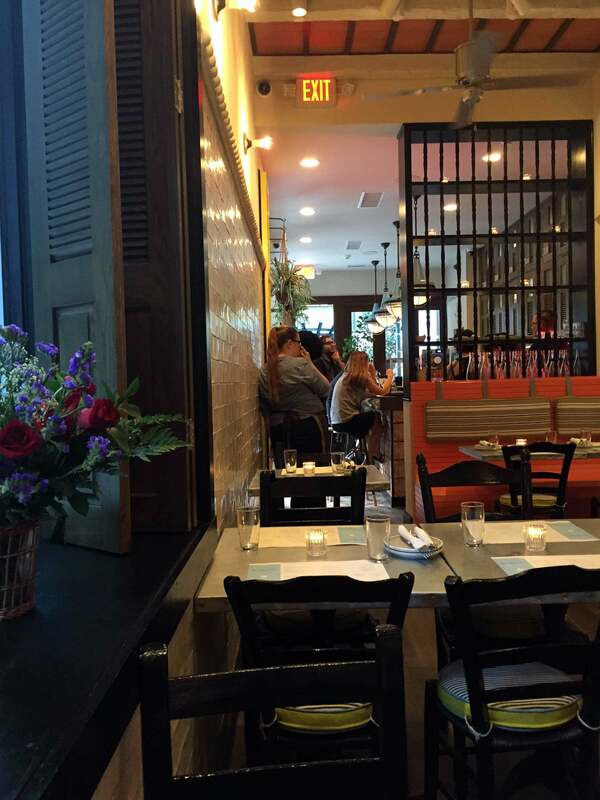 The restaurant makes the most of its narrow space on 18th Street, splitting it in two for a bar up front and seating in the rear, as well as seating outside. The décor fits the space, giving it a Latin flare without being obnoxiously in-your-face. The lighting was also well-done, making the space feel larger than it was—although that may be attributed to the half-empty dining room that was starting to fill up while we were there. I could definitely see the place feeling a little more claustrophobic with a packed house. The food—all vegan—is a pleasant mix of your typical veggie fare (mushroom tacos, salads, guac and salsa) but was also heavy on the meat substitute, which was what really interested us. Can they make these “fake” meats taste like the real thing? Can they still harness the traditional Latin flavors? The answer: a resounding “yes.” Any meat eater—even one opposed to the idea of eating vegan—would be at home here and, if they didn’t know, they wouldn’t be able to tell the difference. Cubano Club – If you only eat one thing here (which would be stupid), make it the club. This has already made it to my favorite sandwiches list, and I’m already looking forward to going back. The grilled chick’n (as the restaurant calls it) breast and the smoked tempeh offer a great backbone for the tangy and oh so good garlic “aioli,” and it’s freshened up by avocado, shaved lettuce, and tomato. Even to an avowed meat eater, this sandwich was damn near perfect. Sopa de arroz con pollo – This item probably interested me the most. Not only getting chick’n into a soup, but also cultivating a broth that would do it justice with no animal parts. And while I’m not sure how they did it, they did. 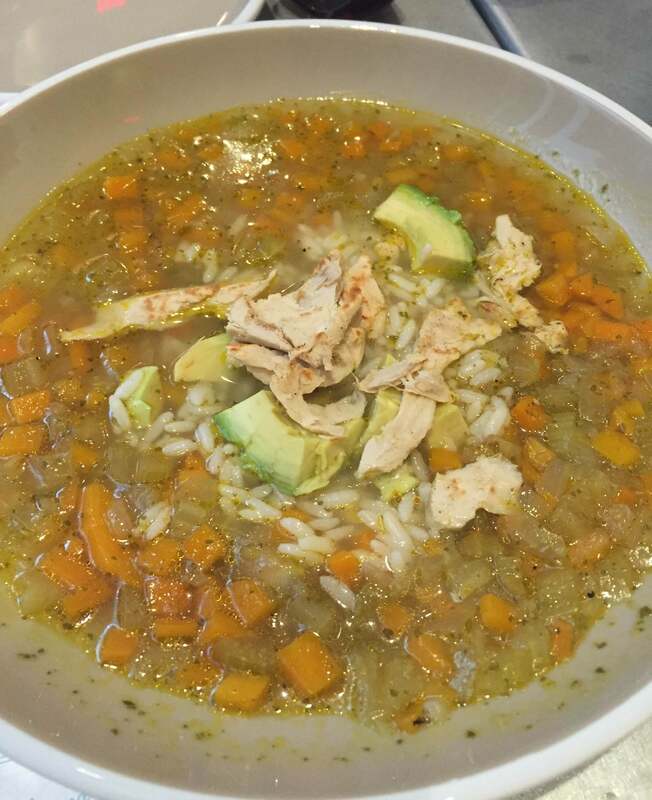 The soup would be the perfect hangover cure—delicious, meaty broth piles with hearty vegetables and rice, topped with avocado and what appeared to the untrained eye to be actual shredded chicken. I couldn’t put the soup down. Pescado tacos – This was another thing that interested me. I’ve heard of chicken and beef substitutes, but never fish. It turns out they use Gardein for their fish, which was surprisingly fish-like, in texture and taste. Not to mention the chipotle slaw that added the necessary spice and zing to the taco and the guac on the bottom that held it all together. Mi Preferida Margarita – I’ve never been one for margaritas, but this one jumped out immediately. Made with Siembra Azul blanco tequila, beet, habanero, and lime, it was as delicious as it was inventive. It was smoky from the tequila, earthy from the beets, and finished off with a little sweet-n-heat from the habanero and lime. Perfectly constructed and wonderfully balanced. I could drink these all night. This entry was posted on August 25, 2015 by Ryan in Review and tagged bar bombon, hipcityveg, latin, margaritas, tacos, vegan.